Once upon a time, it was rather easy to return a rental vehicle without being scrutinized for your consumption of fuel — depending on the company from which you rented your car, of course. …and with a premium charged to you for up to triple the cost of fuel which could otherwise be purchased at a typical service station, there is the potential for rental car companies to profit handsomely. If so, they might be able to get away with this practice on a business person with an expense account who may not care as much as you would if it personally will cost you. Whether the rental car company is purposely trying to scam you or committed a legitimate error is important but is not the issue here. How do you protect yourself from being charged for fuel by the rental car company even though you returned the vehicle with a full tank of gasoline? This is your single most important item which will prove that you purchased fuel before returning the rental vehicle, as it will include such information as the date, time and location of where you filled up the fuel tank of the rental vehicle. If you drove the rental vehicle for only a few miles and spent a few dollars to top off the tank, it is very easy to simply shrug off the miniscule expense and forgo the receipt — until the rental car company attempts to charge you double or triple the amount that you paid at the petrol station just down the road. Some rental car companies — such as Avis and Hertz, for example — are now offering an “express fuel” refueling option for vehicles rented in the United States. If you drive 75 miles or less and do not purchase fuel — or purchase fuel but fail to produce a receipt — a charge of $13.99 will be applied. If you drive 75 miles or less and produce a receipt of a fuel purchase which occurred during your vehicle rental, the $13.99 charge will not be applied. While the “express fuel” option is not an exorbitantly usurious amount of money, it is still significantly more expensive than if you filled the tank yourself, as I illustrated using a couple of examples of calculations in this article. Also, keep in mind about where you refuel your vehicle: some rental car companies have a policy where the refueling must occur within a certain distance of the facility to where you are returning the vehicle — such as in this article I wrote on Sunday, September 25, 2011 where a renter was charged a fee equivalent to the cost of two gallons of gasoline for having filled the fuel tank of a rental car twelve miles from the facility when it should have been done within ten miles of the facility. Some people consider this policy little more than a scam. All because you returned the rental car and you are several hundred miles away does not mean that the rental car company cannot tack on an additional charge for fuel — or other items and expenses, for that matter — onto your credit card account; and there are times where the customer is not informed of the extra charge at all by a representative of the rental car company. In fact, sometimes a careful look at a credit card statement can be the only way to find out about any charges added on after the rental has ended. That has happened to me more than once; and I have won every dispute as a result. An example of why you should keep the receipt of your fuel purchase is found in this article I wrote on Monday, March 12, 2012 pertaining to a person who was charged $35.76 on top of what was already paid for the rental car for 3.71 gallons of additional fuel long after the rental of a vehicle had already concluded — and the person already disposed of the receipt by the time the charge appeared on the credit card statement. Who actually noted that the fuel tank was full upon return of the rental vehicle: the customer who rented the vehicle in question; or the agent of the rental car facility? Does it matter — especially if the fuel gauge in the car indeed indicated that the tank was full upon the return of the vehicle; yet there is no proof of the confirmation? What is to prevent car rental companies from doing this to every customer, and what recourse does a customer have? Is this attempted recouping of dollars for fuel a result of lost revenue which the rental car facility is attempting to minimize — or is it a devious way to add revenue at little to no cost for the rental car facility? Regardless of the answers to those questions, wait until you pay for the rental of the vehicle in full before you consider the disposal of that receipt — although I would keep the receipt for a longer period of time, just to be certain. That device — smartphone, tablet. etc. — which you regularly carry around with you is almost certainly equipped with a camera capable of recording photographs and video. Use it to protect yourself by recording evidence that you indeed filled up the tank at a fueling station, and take at least one photograph of the fuel gauge and the odometer in the car. Overkill? Perhaps — until you are faced with being charged by the rental car company for fuel. That happened to a friend of mind recently when he rented a truck and I helped him move his belongings. Due to a faulty fuel gauge to which I can attest, he was overcharged for fuel by $125.00. He took photographs and video of the faulty fuel gauge as well as the act of filling the fuel tank of the truck while at a gasoline station just prior to returning the truck to the rental facility after hours. He presented his case via e-mail message and won. 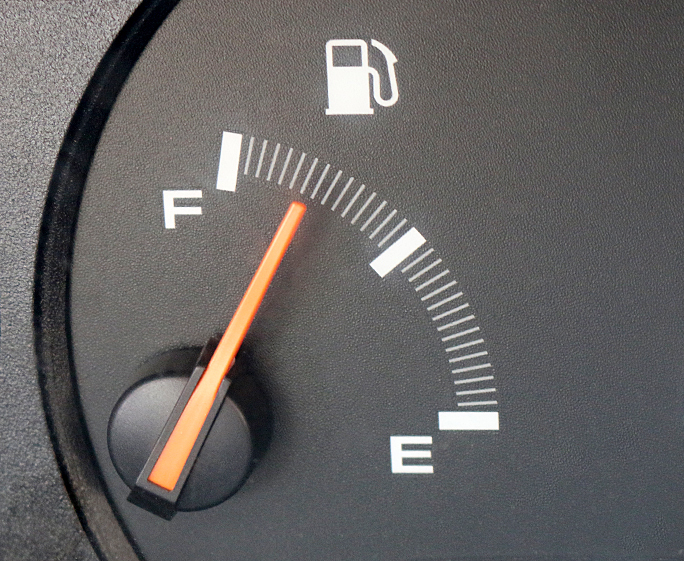 Sometimes the fuel indicator can show less than a full tank of fuel before driving the vehicle off of the rental car property, which can be annoying as that costs money. Immediately call attention to a representative of the rental car facility and have that person mark down the actual reading of the fuel gauge; and take a photograph of it as well. Also, different vehicles have different ways the fuel indicators show how much fuel is left in the tank due to a number of factors, including but not limited to degrees of accuracy and fuel economy. I have rented literally hundreds of cars in my travels and have driven cars whose fuel indicators barely budge for many miles and then suddenly drop quickly when getting closer to empty. I have seen the reverse effect as well. Get to know how the indicator of the fuel gauge works as best as you possibly can to ensure that you do not overfill the vehicle with fuel, as that can be costly for you as well. As with the receipt, do not delete the photographs and videos until you pay for the rental of the vehicle in full. If space is scarce on the drive of your electronic device, consider saving it to a different means of storage, such as a computer, a hard disk drive, a flash drive, a compact disc, or remotely on your wireless network. It is usually better to resolve the issue with a live person rather than calling a customer service representative in some corporate headquarters somewhere — but be forewarned that this could potentially take up a significant amount of your time, depending on how crowded is the rental car facility. It is not worth missing your flight or being late for an important appointment — so consider skipping this step if you believe that you do not have enough time to resolve this issue at the rental car facility where you returned the vehicle which you rented. Of course, it helps to return the vehicle when the rental car facility is open, as you could experience problems and issues if you return the vehicle after hours — so be careful about returning the rental vehicle after hours as you are obviously unable to receive a receipt. Better yet: avoid returning a vehicle to a rental facility after hours at all, if you are able to do so. Ensure that you have your evidence beforehand. Do not be discouraged if the problem you are experiencing is not resolved the first time — call back until you are in contact with a customer service representative of the rental car company who will be sympathetic to the issue and willing to resolve it. While there are no guarantees, a history of loyalty can be significant enough for a dispute to be resolved in your favor, giving you the benefit of the doubt when you rent your vehicles from the same rental car company as often as possible. This is a last resort if the issue of being charged for fuel when you returned the car with a full tank has not yet been resolved, as being refunded the charge before the issue is resolved could be significantly more difficult once you have paid the credit card company. Explain to the customer service representative of the credit card company that you are disputing the charge due to being charged for fuel for which you did not pay, and that you do not intend to pay for that particular charge until the issue is resolved. Although your case for your dispute could be stronger if the charge for gasoline at a service station is on the same credit card statement as the charge for your rental car, there should not be any problem with the credit card company cooperating with you and granting your request — depending on the credit card company, of course. As I already stated, I have had to resort to disputing charges on my credit card statement — and I have won the dispute each and every time. Unfortunately, you have to be as diligent and as alert as possible to ensure that you are not being charged for something you did not use. The aforementioned steps should help mitigate — or even eliminate — unwanted charges from renting vehicles from happening to you. Compile as much proof as possible that you have indeed returned the vehicle to the car rental facility in the optimum condition in which they expect for it to be returned, free of damage and with a full tank. For additional information and details, please be sure to read my advice of 13 tips on what you can do to prevent from being scammed by a rental car company whenever you rent a vehicle — and not just dealing with fuel. Language: Why Do We Name Places As We Do? That is a rarity, Charlie; but I am glad that you were successful with using the convenience fee to your advantage. I think at this point I’ll just drop it off bone dry and tell them it was full. I’ll pay the fee then harass them until they refunded my money just to shut me up. If they insist on trying to rip people off they need to know how it feels. I do not want to learn that you have been stranded on the road because your rental vehicle ran out of gasoline before arriving at the rental car facility, David. At least leave a drop of fuel in the tank. This is the new scam from rental car companies. It happened to me the last two times I rented with Alamo. They checked the tank was full, gave me the receipt and later I saw a rip off charge on my credit card. Same goes for damages. We should all battle for a change in the law where by the time you are given a receipt that you delivered the car in perfect condition and with a full tank you are no longer responsible for anything that happens to that car. Rental car companies know many people don’t do all the steps you described above for several different reasons but mainly because they don’t have time. That is when they take advantage and try to get extra money from customers. Rental car personnel do a lousy job when you return a car because usually they are in a hurry or short staffed and then later you pay the bill. Your suggestion of keeping the receipt is not always valid since most of the times I fill the tank the night before when I am staying close to the airport. Thus, they can dispute that I filled the tank 12 hours before returning the car and say I drove during that time. Also, if you leave to fill the tank close to the airport you will for sure pay the most expensive price in the city. Unfortunately, Santastico, there are those customers who purposely “game” the system and hide any potential liabilities for which they would otherwise be responsible — leaving the rental car companies on the short end of the stick. I am not defending the rental car companies by any means, and I do not agree with many of their methods and policies; but how else can they protect themselves without seemingly taking advantage of their customers? As for the receipt, you present a good point. Like you, I prefer to take care of as much as possible the night before a flight — including filling up the tank of the rental vehicle with gasoline — and I tend to never fill up at a gasoline station near the airport for the very reason you stated: the unreasonably high cost of fuel. Regardless, I still would rather have the receipt as evidence in the case of a dispute — I still maintain that it is better to have the receipt than not — and perhaps taking photographs and video of the odometer while fueling the vehicle will offer further proof that you only drove the distance between the fuel station and the rental car facility. That is a good idea, mike murphy. I cannot imagine an agent of the rental car facility declining such a simple request. many car returns at airport at early hours do not have an agent to receive the car. You drop the key in a Mailbox. Take pictures of your car before starting your trip for any existing damages. Take pictures of the dash to show the return miles and fuel gauge. Take pictures of the car condition on your return. Hertz try to collect damages 6 month after I return the car claiming I had crash the vehicle. The car was received by a Hertz agent in Tampa Airport. Besides the damages Hertz wanted to charge lost of revenues on the unit since it was at the repair shop. I was surprised at this since being a Gold Member for over 20 years renting 12 to 15 times a year. I just returned a europcar at Florence airport. The office was closed since our flight was very early. I dropped the keys and took photos around the car and the dash gauges. I had filled the gas at Q8 station at the airport. Eurocar send me an invoice for 146 euros for 50 liters @ 1.95 and taxes. I send them the dash picture full of gas and ending miles. In Milan hertz charge me over 100 euros to clean the car. I had the pictures of the delivery at Naples and send them for them to see how the car was already dirty on delivery. I just had Avis try to pull this nonsense on me! I rented a car online, through my Avis Preferred account, and didn’t see that they added–without my requesting it–a “fuel service option” to return the car empty and pay “market rate” prices to refill it. I would never have selected this option. I returned the car with a full tank of gas, and later that day noticed a new charge of $80. I might not have noticed, but I had prepaid the car so they had to make another charge. I called, sent in credit card statements at their request to prove I had bought gas (why?? they checked the car on return…tank was full), and then escalated when they wanted itemized receipts. I cc’d every higher-up email I could find. They did reverse the charge. I was planning to dispute it next. What a lame scam, why nickel and dime a loyal customer? ?